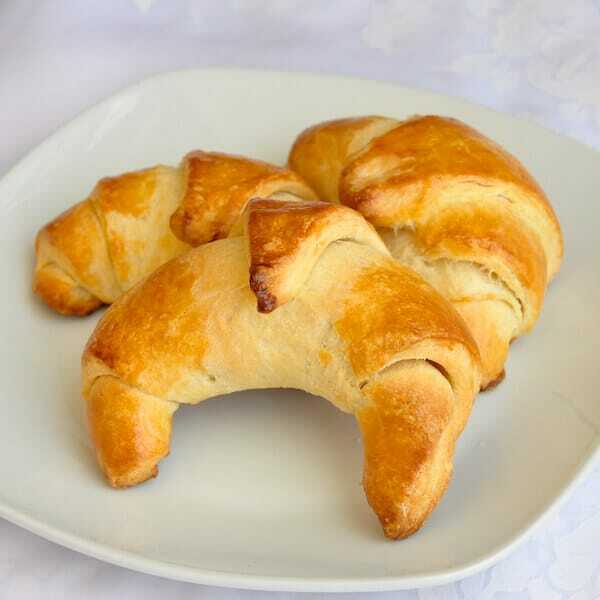 Danish Pastry - an easy dough to make Fruit Danish and more. 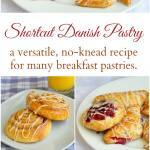 Danish Pastry – the easy way to make Fruit Danish & more. Danish Pastry. Get the shortcut recipe for danish pastry dough that doesn’t even have to be kneaded. 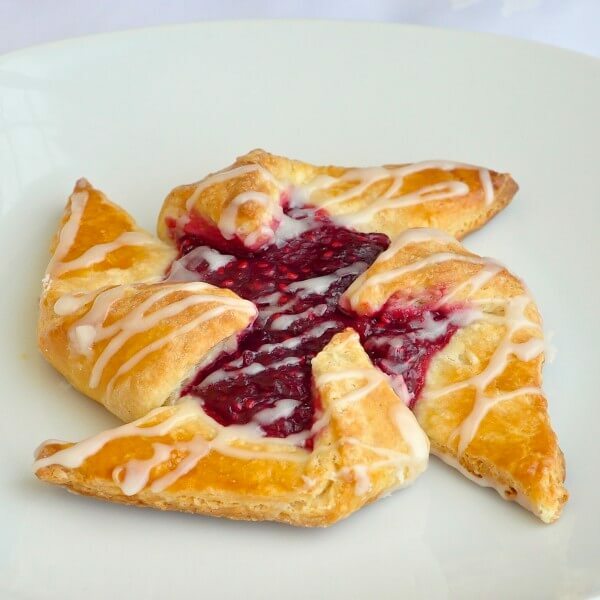 Use it for Fruit Danish, Pinwheels, Turnovers, Crescents and more. This Danish Pastry recipe couldn’t be easier. It does need to be rested for several hours or overnight but doesn’t require kneading or a long term time commitment. If you love a good breakfast pastries, then this recipe is right up your street. 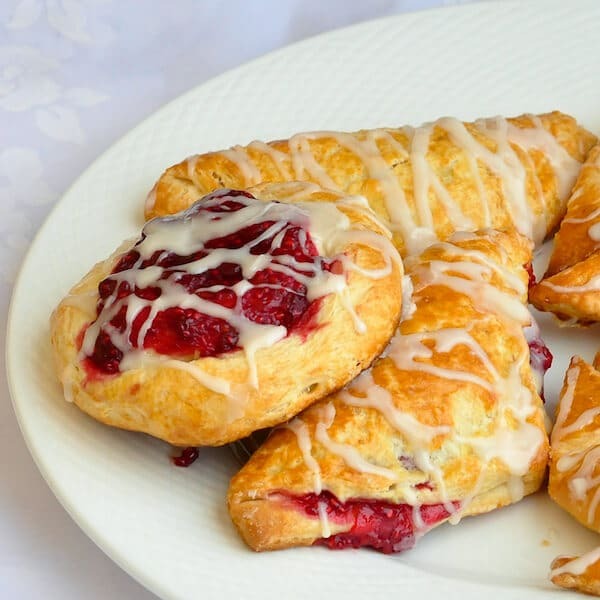 I turn this easy to make and versatile dough into several versions of a breakfast danish; from simple butter crescent rolls to pretty raspberry pinwheels. Unlike many complex danish doughs, which are much akin to the intricacy of making croissants, this dough doesn’t even get kneaded. How easy is that?! Use this versatile recipe with fresh fruit or seasonal jams, with custard filling or with cream cheese and fruit compotes too. Let your imagination and the seasons guide you to using this recipe year round. Like this Plum Cake recipe? 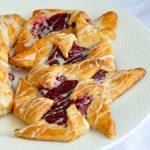 Danish Pastry - the easy way to make Fruit Danish & more. 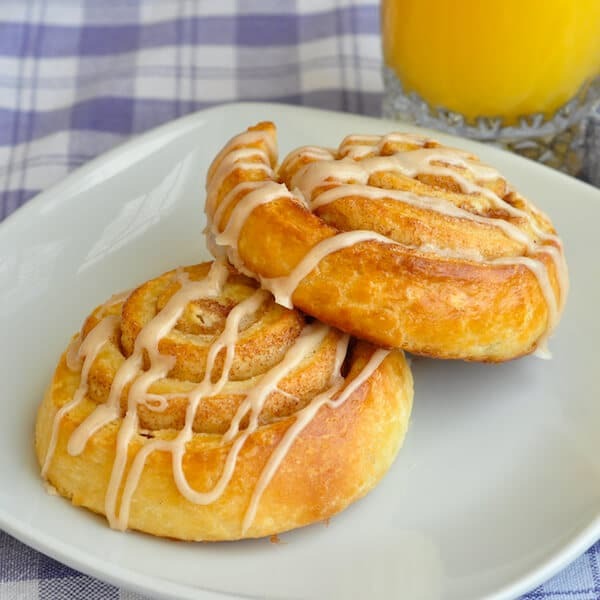 Danish Pastry - get the shortcut recipe for danish pastry dough that doesn't even have to be kneaded. 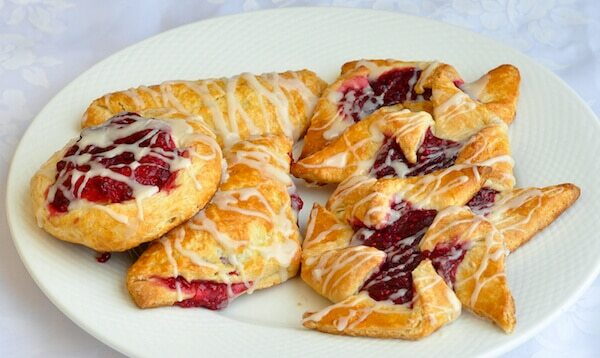 Use it for Fruit Danish, Pinwheels, Turnovers, Crescents and more. Dissolve sugar into the warm water and sprinkle the yeast over the water. Let stand for 15 minutes. In a food processor mix together the flour, sugar and salt. Pulse in the cold butter cubes. Do not over incorporate the butter into the flour mixture. There should still be pea sized chunks of butter in the mix; the same as if you were making good pastry. Remove the mixture from the food processor and transfer to a large mixing bowl. Whisk together the eggs and whipping cream. Stir in the yeast mixture and pour over the flour mixture and toss together with a wooden spoon, just enough to make a dough form. It is not necessary to need this dough. Divide in two portions. Each portion makes about 8-10 pastries so if you don’t need it all right away, double wrap one portion in plastic wrap and freeze it for later. This dough needs to be rested in the fridge for several hours or overnight. After forming into the desired shapes, the pastries should be left to rise for at least a half hour in a warm kitchen. All danishes should be brushed with an egg wash made from whisking together 1 egg with 2 tbsp water before baking on a parchment lined baking sheet at 375 degrees F for 15-20 minutes or until golden brown. Timing depends upon size, larger pastries may take 25 minutes. Roll the dough out into a 12x18 rectangle. Cut into strips on the long side of the rectangle, about just over a half inch wide. Twirl two of the strips together and form into a spiral circle on a parchment lined cookie sheet. Let rise, then dollop a tablespoon or so of fruit or berry jam into the centre before baking. You can brush these with warm apricot jam when they come out of the oven as well. Roll the dough out into a 12x18 rectangle. Sprinkle the entire surface with cinnamon sugar and about 1 cup of raisins. Starting at the short side of the rectangle of the rectangle, roll the dough up into a cylinder pinching the seam together to seal. Cut into ¾ inch thick slices. Roll out to about ¼ inch thick and cut into 4 inch squares. Spoon a tablespoon of raspberry compote in the center and fold over, pressing the edges together to seal. Roll out to about ¼ inch thick and cut into 4 inch squares. Make a 1 inch slit at each corner of the dough, cutting toward the middle. Spoon a tablespoon of raspberry jam in the center then pull every second point of dough toward the center of the pastry. Roll out into a 12x18 rectangle, then cut into tall triangles, 12 inches long and roll those up from the widest end. These are delicious with seasonal jams. Thanks! I think I will try these tomorrow! What is the 3eggs and whipping cream for? It gets mixed with the risen yeast. I just finished four batches of this danish pastry used for the cinnamon rolls, crescent rolls, danish pinwheels and turnovers. Since it is spring, I used my own rhubarb and apple fruit fillings. This is a wonderful pastry and worth the wait with the dough refridgerated overnight. Five stars. Thanks for sharing your success with this. I have only tried the recipe once and my berry filling ran off onto the pan. I have rhubarb ready to cut and my mouth is watering! Can you tell me more about how you made your filling? Well, these are DIVINE! Thank you so much. That being said I did modify the recipe a bit: use half all purpose and half whole wheat pastry flour. Added almond extract to the dough as I like that flavor. Made the dough as directed. SO simple. then froze half and put the rest in the fridge to rest. And didn’t get back to it for 4 days! You know, this thing called life? Well I thought I would try it any ways. I wanted fruit and cheese so whipped some cream cheese with an egg yolk and a couple of spoonfuls of sugar until well blended. My fruit filling was some Jam of various flavors with 50% reduced sugar and whole fruit. rolled the dough, shaped them spread the center with some cheer then a spoonful of jam of the various varieties that I had (cherry, blueberry, raspberry and mixed citrus marmalade) Washed with egg wash and sprinkled on some chopped almonds. I even rolled up the scraps and sprinkled with spiced sugar. These came out divine, and when done I painted with butter. I’m not into glaze. These are AMAZING thanks again. And thanks for a delightful experience. It makes me wonder why I waited so many decades–oh yeah, that pesky dough. Yours was a dream to work with. This recipe is great! Just curious if anyone has any experience with freezing the dough before baking or freezing these after they are baked? ?